Gorzelanny and Silva Make Cubs’ Rotation: Nail Biting Time? I’d be lying if I said I wasn’t at least a little worried about the news that Tom Gorzelanny and Carlos Silva were named to the final two spots of the Cubs’ rotation today. But then, I could see it working out well, too. Here's hoping Silva can be un-bad this year. The bigger surprise here is probably Silva. You can’t go 5-18 in a two-season span and not raise some red flags. Hell, his ERA last year alone was 8.60. He looked like his career was done, yet the Mariners found someone desperate enough to take him in the form of the Cubs (thanks, Milton Bradley!). Yet, he has looked solid this spring, except for his first start when he was lit up for six runs in two innings, exactly the kind of output I was expecting from him, considering the player he was traded for. But then something clicked. His sinker now appears to be working, which will definitely come in handy pitching in a small ballpark like Wrigley Field. Hopefully he can revive his career–he had double-digit win totals three times with Minnesota–and have a solid year. Gorzelanny: a so-so bet for a good year. Gorzelanny is a less nerve wracking rotation candidate. While not having an ERA to write home about the last couple years, he was on his way to stardom with the Pirates in ’07 before getting injured the next year. After getting traded to the Cubs at midseason last year he seemed to start putting it together again. Having seen him pitch when I was in Vegas, I can attest that he looks poised on the mound and he could be primed for a big year, as far as fourth starters are concerned. I could see him winning 10 games maybe. The best thing about the current rotation is that it allows Jeff Samardzija to return to the eighth inning setup role he excelled in during the 2008 pennant race. He may want to be a starter at some point in his career, but his secondary pitches still need some work. Being in the bullpen allows him to rely on his fastball and slider while occasionally tinkering with a changeup here and there. 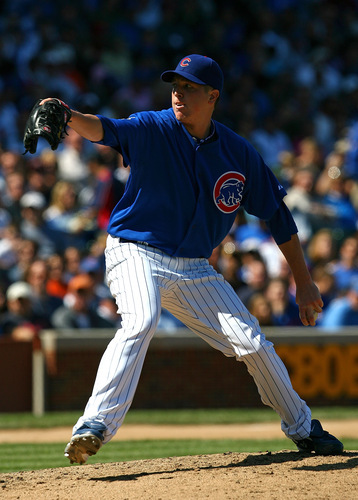 Once he gets a solid third pitch, then we’ll talk about him being a force in the Cubs’ rotation. This decision makes it seem a little like the Cubs are throwing some stuff at the wall to see what will stick. Or they could just be looking for a righty-lefty-righty flow to the rotation without really worrying about the quality of the lefty starter. After all, the guy who’s been the ace the last couple years, Ted Lilly, should be back a couple weeks into the season, right? Right? Gulp. Also, I am apparently distantly related to Gorzelanny, so go Samuelson clan.